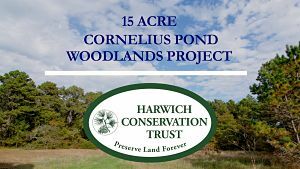 The 15-acre Cornelius Pond Woodlands Project is a shining example of how partnership makes a difference for our Cape Cod quality of life. Many HCT donors including individuals, couples, families, foundations, and businesses contributed funds to this grassroots effort to preserve this priority watershed land that protects pond health and drinking water quality as well as wildlife habitat. Last May, Town Meeting voters also unanimously approved $200,000 in Town Community Preservation Act funds to support the purchase. The State’s announcement of a Conservation Partnership grant completed the $850,000 fundraising campaign. HCT plans to open a walking trail by spring 2020. Thank you one and all for saving this special corner of Cape Cod perched atop Cornelius Pond. 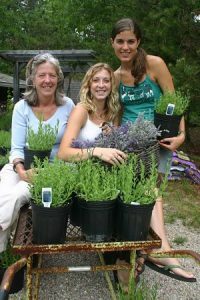 These walks take place close to the summer full moons in May, June, July, August, and September. For the First People, the full moon phases signaled seasonal changes in activity. They lived in concert with the elements and were not bound to a clock or calendar because the moon phases don’t fall on the same day and time annually. While we will likely not see the full moon during our walks, we will experience and discuss its influence. Choose any of the three dates to explore the many ways the natural world transitions from diurnal (daytime) to crepuscular (dawn and dusk) to nocturnal activities as day turns to night. “We survived!” one fifth grader exclaimed as she jumped up and down. Her class at Monomoy Regional Middle School was playing a game about the life cycle of the American eel, taught by Mass Audubon Wellfleet Bay Wildlife Sanctuary School Programs Coordinator Spring Beckhorn with curriculum in part created by 30-year veteran science teacher Valerie Bell. The students from Harwich and Chatham were learning about the Robert F. Smith Cold Brook Preserve owned by Harwich Conservation Trust (HCT) in the heart of Harwich Port. 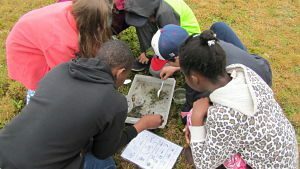 HCT and Wellfleet Audubon are partnering to connect Monomoy students to local conservation land, water, and wildlife, thereby educating future generations about the importance of being sensitive stewards of Cape Cod’s natural heritage. Vision, luck, persistence, compassion, patience, flexibility, fate—just some of the elements that form the origin of the more than 80 rolling acres of forest and wetland that beckon within the Island Pond Conservation Lands. 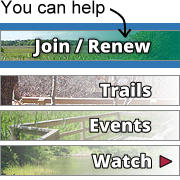 This conservation assemblage with walking trails traversing old cartpaths bordered by bicycle trails near the Town Center has been assembled over 20 years by a partnership among Town Meeting voters, HCT, and landowners with the courage and will to make a difference for land, water, and wildlife. 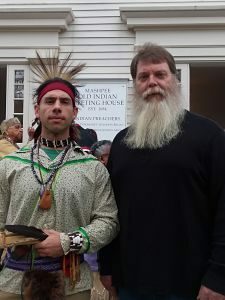 It all started 30 years ago, when a truck went into a ditch in the snow in the snow forcing G. Rockwood Clark and land owner George Canham to get to know each other better while they walked for help. Rocky was looking for Harwich land to buy. Canham, a sheep farmer, then in his 80s, wanted to sell his acres to people he liked and who would appreciate the land, so he gave Rocky and his then wife Cynthia a deal.